​Before you go grocery shopping, make a shopping list that includes foods from all five food groups so you can build a healthy plate at every meal. 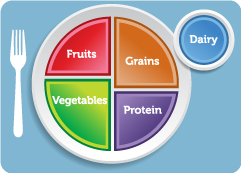 Always try to make half of your plate fruits and vegetables. Consider protein sources other than animal products such as nuts and beans. 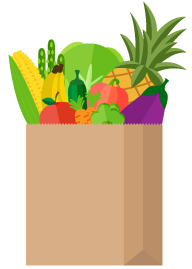 The healthiest foods are located around the edges of the grocery store, which means that less healthy options are located in the middle aisles. Always shop the perimeter first, and then see what else you need from the center aisles. ​Different colors mean different nutrients. When eating fruits and vegetables, try to eat as many colors of the rainbow as you can, so you get a variety of good nutrients. It's always better to choose in-season and local produce. This will save you money, and your produce will taste better because it has traveled less to get to you. Many farmers markets accept SNAP, and some even double your dollars! ​Fruits and Vegetables are great in many forms... but be careful when buying canned and frozen! If in-season fruits and vegetables are limited in your area, frozen and canned produce are great options. Canned and frozen produce is always less expensive than fresh, but it can be high in sodium and sugar. 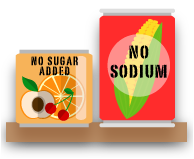 When choosing canned vegetables, choose low or no sodium options. When choosing canned fruits, make sure they are in 100% fruit juice or water rather than syrup. Choose frozen produce without added salt, fats or sugars. Whole grains have more fiber, vitamins, and minerals. Fiber helps to keep you full longer, can help lower cholesterol, and is good for digestive health. 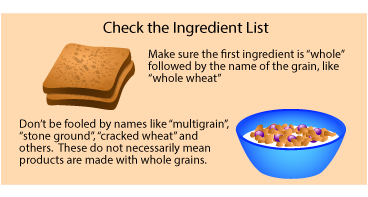 Some whole grains include oats, quinoa and brown rice. 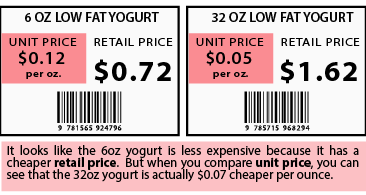 ​Unit pricing makes it easy to compare prices of similar products even though they may be packaged differently, or from different brands. Be sure to compare products with the same measuring unit. For example ounces to ounces or pounds to pounds. Remember, 16 oz = 1 lb! 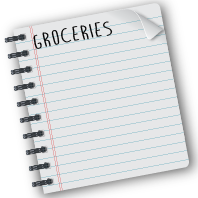 ​Planning will save time and money at the grocery store, and will make meal preparation easy. Take advantage of sales! Use the store’s bargain flyer to help plan your meals. Make your list before you go to the store and buy only what’s on your list. Sticking to your list will keep you within budget, and will prevent food from going to waste. If you end up with extra food, remember you can almost always freeze it! Keep this in mind especially if foods are on sale! You will not only save money, but meal time will be more interesting. Rather than eating the same foods all the time, experiment with trying foods in different ways. For example, you can eat beans by themselves, puree them in a dip to eat with tortillas or vegetables, have them on salads, or add them to chili and stews.